Every Sabre fifth wheel we build combines luxury, style, and affordability without ever sacrificing quality. 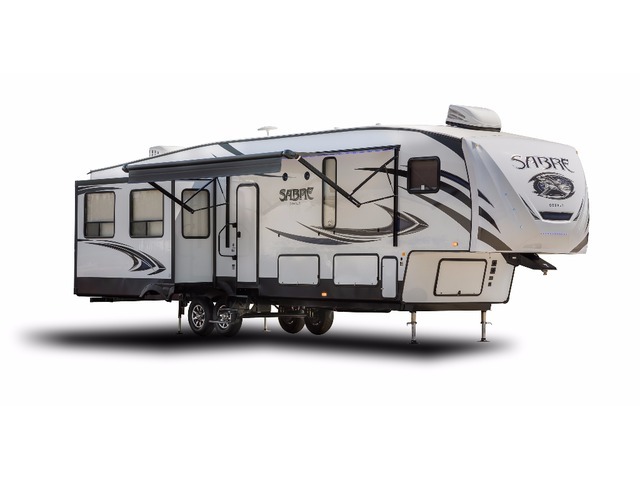 Built on America’s most popular floor plans, along with the longest list of standard features, we are committed to providing the best fifth wheel value in the industry today. Luxurious living areas, residential kitchen appointments and all the comforts of home make Sabre the clear choice when it’s time to head for the great outdoors. Dry Weight 9,833 lbs Pin Weight 1,935 lbs Overall Length 34' 1"
Dry Weight 9,918 lbs Pin Weight 1,740 lbs Overall Length 36' 0"
Dry Weight 10,058 lbs Pin Weight 1,955 lbs Overall Length 36' 7"
Dry Weight 9,978 lbs Pin Weight 1,845 lbs Overall Length 36' 4"
Dry Weight 11,378 lbs Pin Weight 2,075 lbs Overall Length 40' 8"
Dry Weight 12,483 lbs Pin Weight 1,867 lbs Overall Length 41' 6"
Dry Weight 12,493 lbs Pin Weight 2,030 lbs Overall Length 42' 7"
Dry Weight 12,213 lbs Pin Weight 1,950 lbs Overall Length 42' 5"